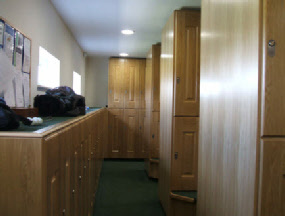 There are Male and Female Changing / Locker Rooms with Showers and Toilets detached from the clubhouse but close at hand and next to the Practice Putting Green, Pro-Shop and First Tee. A Caddy Cart Store is available and is adjacent to the Changing /Locker Rooms. The practice putting green is strategically placed between the clubhouse, Pro-Shop, and First Tee to allow you to enjoy a leisurely start to your game of golf. Members and visitors may hire golf buggies and caddy carts from the Pro-Shop subject to availability. A large practice fairway is available a short walk from the Clubhouse. This includes, a chipping area and green, sand bunkers and green and a substantial practice fairway area.